“IT HAS BEEN A HONOR TO PLAY IN TROMBONES OF COSTA RICA. Leonel Rodríguez Cambronero grew up in Barva, a community located in the north of the province of Heredia Costa Rica, where he began his musical studies in the music school of his community with Professor Humberto Vaglio. He continued his training at the National Institute of Music and at the University of Costa Rica where he obtained his Masters in Music with Indiana University professor Peter Ellefson. 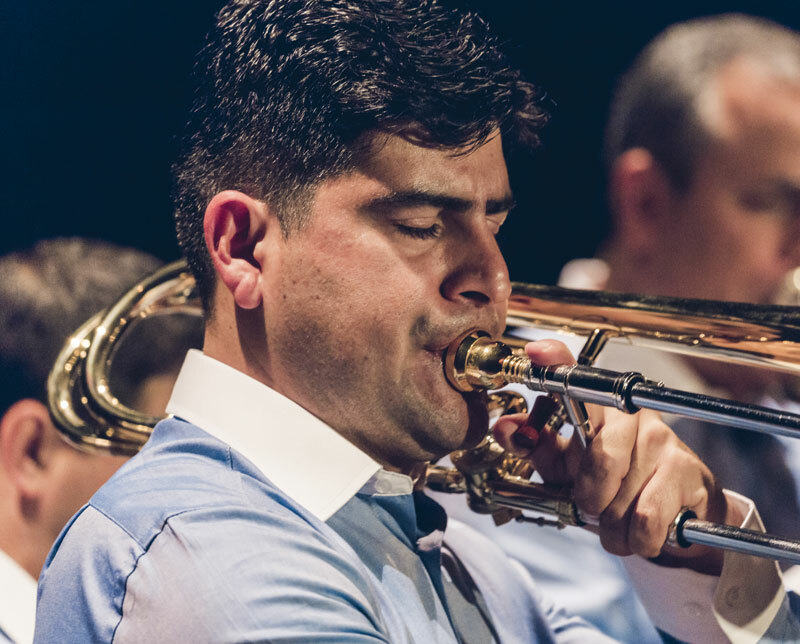 Rodríguez is a member of the prestigious Costa Rican chamber group TROMBONES DE COSTA RICA. With this group he has toured several continents performing recitals, solo concerts and offering talks and master classes in important concert halls and artistic and educational institutions. He has also produced four record productions with worldwide distribution that include Latin American and original Costa Rican repertoire. Among the awards that he has won are the 1997 National Music Prize in the category of chamber music, the 1999 Passau City Special Prize in Germany, both with Trombones from Costa Rica and finalist in the Gold Medal contest. Her solo career includes almost twenty years of experience performing concerts for institutions like Barva Symphonic Band, Pérez Zeledón Symphonic Band, Alajuela Concert Band, Heredia y Limón, University of Costa Rica, National Institute of Music of Costa Rica, Orchestra National Symphony of Costa Rica, Ecuador Symphony Orchestra, Miami Wind Ensemble, and The United States Army Band and Orchestra. He has been guest soloist and faculty of innumerable international events among which stand out; International Trombone Festival 2001, 2002, 2008 and 2010; Eastern Trombone Workshop 2004 and 2010 in Washington DC; Brazilian Festival of Trombonists 2004; Latin American Congress of Trombone 2004; Big 12 Area Trombone Conference, Lubbock, Texas 2005; The Midwest Clinic for Conductors and Musical Educators, Chicago 2006; Iowa Band Masters Association Conference, Des Moines, Iowa 2007; Texas Musical Educator Association Conference, San Antonio, Texas 2008. In addition, he has participated as a guest musician of groups such as OTI International Orchestra, Rubén Blades, Eddie Santiago, Maelo Ruíz, Tony Vega, Luisito Carrión, Big Band of Costa Rica, Son of Tikizia among others. He is director and trombonist of the outstanding Latin jazz group and salsa Rumba Jam, with which he recorded his first CD “Where My Name Is Waiting” in conjunction with the national singer-songwriter Bernardo Quesada, having a very good reception in the public; With this group they have performed with the Concert Band of Alajuela, Heredia and Limón, in addition to prestigious concerts such as the Festival of Arts 2010. In the year 2013 he recorded his second album: Rumba Jam Latin Jazz. Mr. Rodríguez has complemented his artistic activity with teaching positions in important institutions of the country such as the International College of Canada (band program director), Barva de Heredia School of Music (director of the Big Band, solfeo, improvisation course and choir of bronzes ). He is currently a professor of music education, culture, trombone and director of the big band and the Symphonic Band of the Basic Stage Pacific Headquarters of the University of Costa Rica. In addition, he works as official artist of the EDWARDS Trombones.